Heat 2 tsp oil in a large wok or frying pan, then add the beans and cook over a high heat for 5 minutes, to defrost. Add the onion and pepper and fry for 3-5 minutes more, until the vegetables start to soften. Tip onto a plate. Add the remaining oil to the pan, then fry the chicken for 3 minutes, stirring continuously, until browned on the outside. Add 2 tbsp cold water, then cover the pan and simmer for 5-7 minutes until the meat is cooked through. 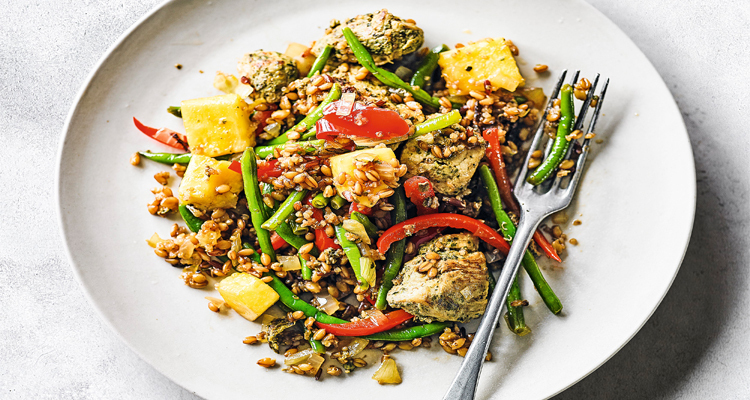 Stir in the pineapple and the grains, then return the vegetables to the pan. Stir-fry until piping hot. Splash in the soy sauce (if using), toss well, then serve.